Download our FREE guide and learn everything you need to know about VAT, when to charge it and how to calculate it correctly. Our FREE Guide, “How to Recruit and Retain More Drivers – The Top 10 Things You Need to Know” will give you all the answers you need to getting the drivers your business deserves. The iCabbi system is probably the most advanced cloud-based taxi dispatch system in the world. Our feature rich, automated dispatch system will match the offerings of any of the market leading solutions. As a new player entering the market, iCabbi have embraced the opportunity to objectively identify the common pains facing taxi companies with their existing providers and have focused on these areas to develop one of the most innovative and exciting products to enter the industry in a long time. The taxi industry is in a global state of transition and at iCabbi, we firmly believe the solution you choose for your business now has never been so important. Hardware based products are solutions of the past, with mobile and cloud technologies undoubtedly being the future. Competitors sell static products that start becoming obsolete from the moment they go live, the iCabbi system evolves. We are uniquely positioned to offer a solution that will future proof your business. Most of our customer base have experienced significant growth within months of going live on iCabbi. We install your system to be fully optimised, with features that promote automation constantly receiving upgrades. A more efficient system gives you more time back and saves you money, but don’t just take our word for it! “iCabbi has a lot of great features, especially the DiSC telephone system, the app and the web booking system. 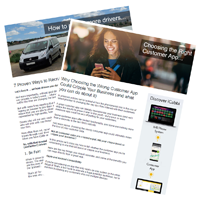 One very big plus point is having an app for customers, as well as the web booker. It is pushing up bookings because younger customers want the app and we can now tell them that we have an app. After just 8 months with iCabbi our app bookings are growing all the time.